Here's my progress so far with the Avast cardigan. 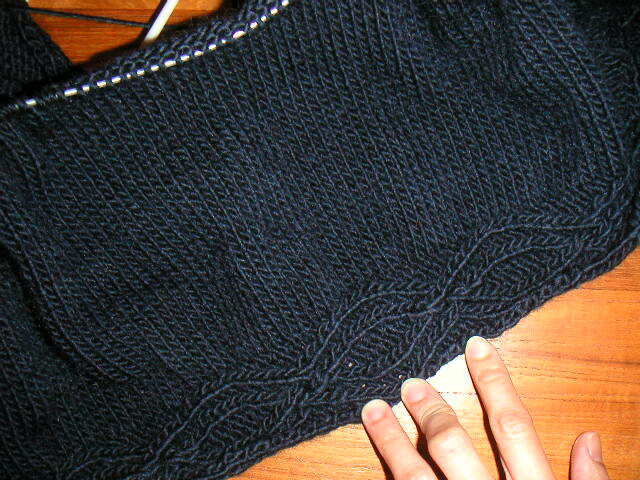 Once I got the cabled band finished at the hem, I had to pick up 221 stitches! Needless to say, all this stockinette stitch is taking forever and it looks like I'm only halfway to the required 16 inches before starting the sleeves. But it's beautiful--there's nothing so rich looking as well knitted stockingnette (Sp? )anyway, perserverance will have its reward. Good luck. It's beautiful, a great color and only a week after finishing Central Park Hoodie! It seems to me that it is going very quickly. Good work, and fast! The long stretch isn't fun, but it's looking SO good. I realized 3 inches later that I accidentally added a design element (k2 p1 in stead k all)in my sweater and just called it "on purpose". :) How is class going?